This web site is intended for the serious and casual researcher. Click on the Municipalities bar above and select the township or boro you want to look at. There you will find 18th and 19th century tax records, early censuses, cemeteries lists, town directories, maps etc. Then visit the Genealogical Resources link above where there are numerous books on Delaware County history from the 19th and early 20th century. Records are added regularly so please check back often. Most of what you see here and what will be added comes from the forty-five year accumulation of Delaware County Historical memorabilia amassed by Keith Lockhart.This web site has been made possible through the combined efforts of former Delaware County State Representative Ron Raymond, who obtained funding for the web site, and historian Keith Lockhart. Keith is a lifelong Ridley Township resident and a graduate of Penn State University. He has written numerous booklets on the history of the area and for many years penned a history column for Town talk. He has also shared his vast knowledge of local history through articles for both the Philadelphia Inquirer and the Daily Times Newspapers. Through the dedication and hard work of numerous typists the transcription of the tax and census records took over two years of work to complete. My sincere gratitude goes out to these people. A special thanks to my wife, Mary Lockhart, Donna Greenbarg of Hatboro, Janice Daleandro of Morton, Ethel Dougherty of Norwood, Dawn Beck of Springfield. Keith Lockhart's collection contains many rare books and booklets on Delaware County Pa. History that are not available anywhere else. These booklets run the gamut from the Delaware County Society to Detect Horse Thieves in 1850 to Prospectus's for Delaware County Businesses . Contact Keith Lockhart today. If you have never visited my Delco History blog above, PLEASE take a look! Includes pictures and info on the county. February 23, 2019- just added more historical newspaper stories about early Marcus Hook, Viscose Village, J. N. Pew, the Union Hotel etc. Check them out!!! March 3, 2019- more marriages of the Delaware Co. American Newspaper of Media have been added. March 10, 2019- Sheila Kozel has added the Prospect Park/Moore 1889 Business Directory to the Prospect Park Page. AND Susan who at met at DCHS awhile ago also wants to help type!!! Always looking for typists to add more information. March 19, 2019- more marriages from the Delaware Co. American Newspaper of Media have been added. April 14, 2019- a large update. A number of newspsaper articles have been added to the Aston and Bethel pages please check them out. Articles about important happenings from 100 plus years ago. New typist, Sue has been hard at work going over impossible to read microfilm and making corrections. She also added the 1889 business directory for Fernwood in Upper Darby. This link is to let everyone know what new books and booklets that are out, dealing with Delaware County history. If you would like to make people aware of any new books please let me know. 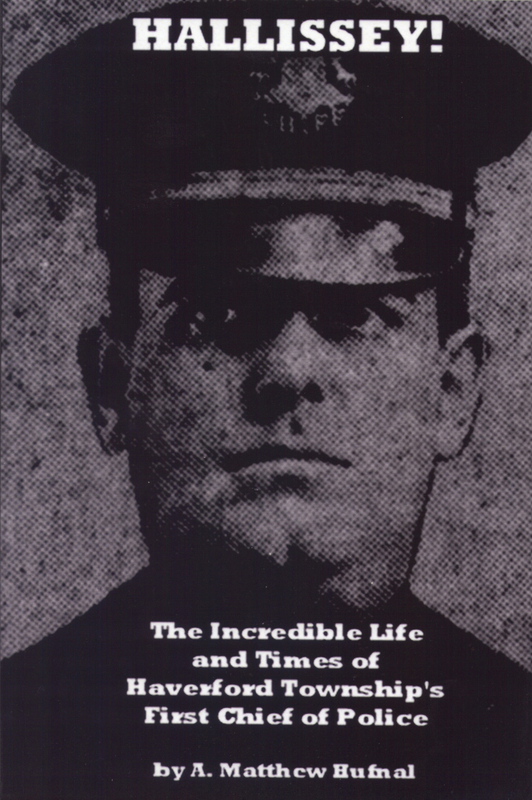 Haverford Township police officer, Matt Hufnal has written a new book, "Hallissey" about the making of the first police chief in Haverford and the problems that were involved. It was not easy creating and running a police department 100 years ago!! The book which just came out in late August 2018 is available on Amazon. Click on Amazon to go to the link to purchase the book. David Komarnicki is out and available from Amazon. People who have read it, love it!! Check face book ! April, 2017 is another Arcadia Book, "The Williamson College of the Trades" , all about the great history of that Delco institution. The book is by Andrew Miller who teaches history at Neumann College. 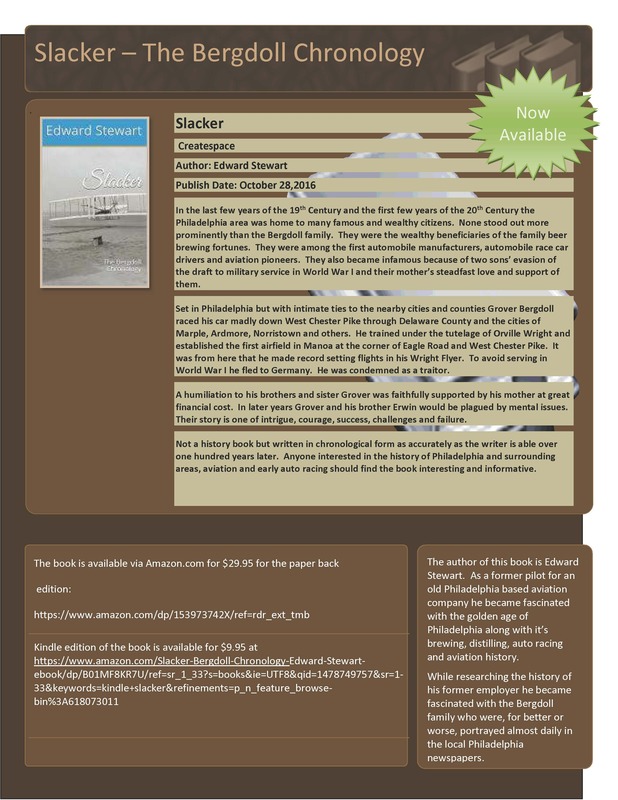 Just in time for Christmas 2016, Ed Stewart has published, "Slacker" the story of Grover Bergdoll whose well to do family lived in Delaware County. Bergdoll fled to Germany during the First World War rather than be drafted. The story caused national head lines in the day. Read this well done book about a family crisis and what happend to them. Another new book is out this Spring, 2016 "Immortal of the Cinder Path" the story of James 'Ted" Meredith by Jack Lemon. Meredith a Delco native set two world and Olympic records in Stockholm, Sweden. The book is by Jack Lemon from Media class of 1964. Click on the link above to order the book and for more information. Delaware County Historical Events,Lectures, Meetings Etc. Stan Bowman of Chester County was born and raised in Delaware County and began taking pictures of trolleys in his teens. In the past 50 odd years he has amassed the largest collection of trolley pictures and information around. Stan has been kind enough to share some of his pictures and information with my site and over the next month or so, maps, pictures and information will be added about all the trolley routes and companies that once operated in Delaware County. A new mill page has been created, to go to it, click the link above. It features the 1826 mill survey, the report of the 1843 flood and a rare mill map for the entire county also from 1843. More will be added to this site in the next few months. This page has been opened for Delaware County Newspapers. The link for the Chester Times to search it, is now here. The good news after numerous scanning and experimenting the first year of the Morton Chronicle from 1880-1881 is now on the site and can be searched. More years will be added next week most from my personal collection. It has taken allot longer than I thought to do this but it will be well worth it. Take a look and let me know what you think. The Delaware County Realty News was a column first published in the Chester Times in April of 1912. It was a weekly column that talked of new buildings, developers, architects etc. Even building permits etc. Take a look! In 1936 the W.P.A. did a historic Site Survey of Delaware County by township. They put basic info done only and NEVER used addresses only approximate locations. I have begun to update it by adding addresses, taking pictures and correcting some wrong information. Please have a look. PLEASE Email me if you have a question!! But have left no way for me to contact them!